Our semi-round open can has a flat back for placement against the wall and out of the way, while its open lid design makes it easy to toss in trash on the go. The sturdy stainless steel construction, lift-off lid, and large capacity make it an ideal choice for commercial spaces such as restaurants and coffee shops, or even busy families. ADA-compliant. Great for high-traffic areas, the lid has an open design so it's quick and easy to access. Large capacity and an open lid make this an ideal choice for small businesses such as restaurants and coffee shops, or even busy households. Just grab the side handles to move the can. The custom liners are great but I have found a much more cost effective liner at Sam's Club that works just as well. 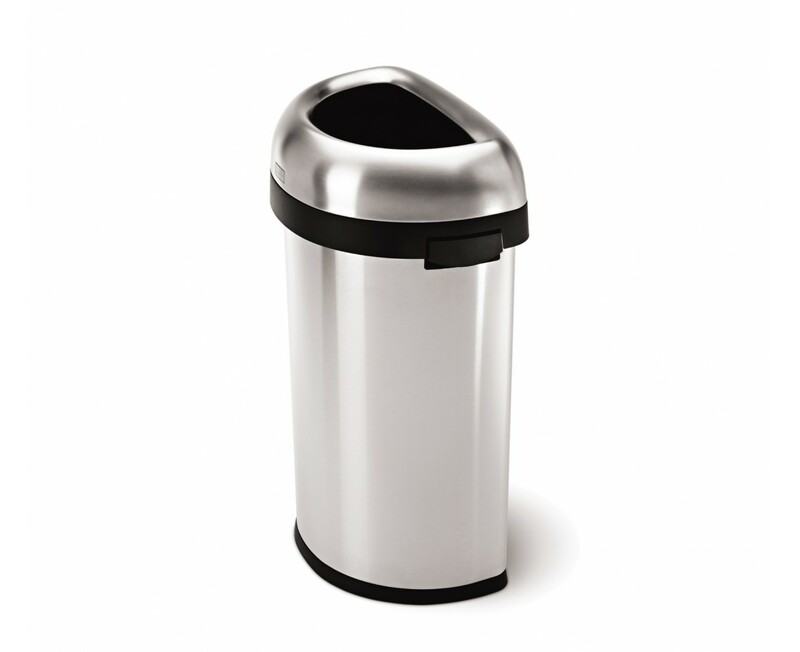 The fit and finish are great it's a very nice trashcan. But let's face it it's a trashcan without any moving parts, Kinda hard to screw up. I would rate it higher if it wasn't so expensive. Just so you know: I bought my first SimpleHuman garbage can a few weeks prior to this one. I was so enamoured with the design and practicality of it that I bought a second one for my office and this 60 litre, semi-round open can for all my recycled waste. They look awesome and are really really practical! Thanks guys!!! Very attractive and functional. Would be even better if larger capacities were available. I purchased the simplehuman brushed stainless steel 60 litre can for my nephew's upcoming wedding. I purchased the wedding gift online and had simplehuman ship it across country to my brother's address in Atlanta. My nephew and his soon to be bride were ecstatic with this product as were my brother and sister-in-law. Thank you simplehuman. 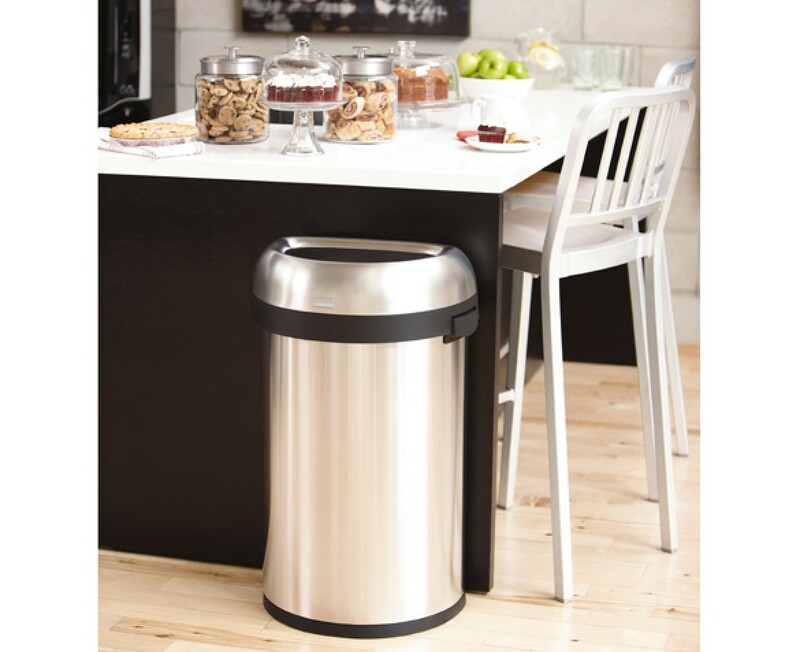 (I own a similar simplehuman item and have appreciated its usefulness in my kitchen area). Is it possible to fall in love with a garbage can? I think maybe it is. I am crazy about this can. First. the shape. The fact that one side is flat makes it possible to place it agains the wall and it doesn't stick out too much into the room. I love the open top. I can literally pitch some trash into the can from a few feet away. This can is not a light weight. It's pretty heavy and solid so I don't worry about ti tipping over. I am using it in my kitchen. It is not small. My kitchen is small but this can is not. I just think it's beautiful and super functional. Could not be happier. Yup, it's love. It's a nice trash can, but I really wish it had some inserts on the top to keep the garbage from being exposed. I did write you an e-mail regarding this, but haven't heard back. Is there some way to "fix" this? Thank you for your feedback. Although this particular model is designed to be open, we offer other commercial cans such as our swing top can and plastic swing lid can that have a lid. Great trash can! I love the large size and the fact that it holds more than your standard kitchen garbage can. Looks great with other stainless steel appliances. My first Simple Human trash can was a 60 litre Round Open can which I have in the kitchen. We entertain a lot at home and it just made sense when there were so many people in the kitchen trying to help. Well, I didn't think it would get much better until I saw the Semi-Round. Wow! I have the Open Semi-Round under the lip of the kitchen island and the Open Round on the other end the kitchen. The open top makes so much sense. Nobody's foot is being stepped on acidentally when multiple people approach at the same time. And there's no longer a bottle neck when more than one person needs to throw something away. They blend in beautifully with all the stainless steel in my kitchen, but at the same time they attract a lot of attention. They are absolutely stunning. I bought this for the conference room in my office. It looks very nice and professional. My favorite part is that the trash bag is hidden. They give you free sample trash bags as well! I love innovative well made products and I will soon buy for my own home. Great looking trash can for our office. I hope we get a free one! i use my trashcan everyday. i like how big it is. and i love the way it looks. Although this item was made to be used as a garbage can, I needed something that would allow me to hold my recyclables. This can does the job. I didn't realize it was so big. I fill it up with my recyclables and once a week I take it down to my garage to empty into the city's recycling bin. It works great! Plus, it sits flush against my wall so it doesn't take up a lot of space in my kitchen, and it's just the right height. Great can! Holds so much, attractive, easy to change bags. Love it.